While the Israeli military justifies its uncompromising ‘retaliation’ against Gaza, hundreds of Palestinian civilians have died and been injured as a result, with no equivalent casualties in Israel as of press time. Much has been said in the Western media about Israel’s right to protect itself against aggression, but very few mentions can be found on how civilian targets have been leveled, except for Al Jazeera and Russia’s RT news channel. Indeed that has happened today, when Israel navy commandos raided a suspected missile launch site, as confirmed by IDF’s Twitter page: “BREAKING: IDF forces raided a site used to fire long-range rockets at Israel. The mission was accomplished.” Indeed, with some 20,000 troops mobilized, Israel keeps a full-scale invasion as an option. 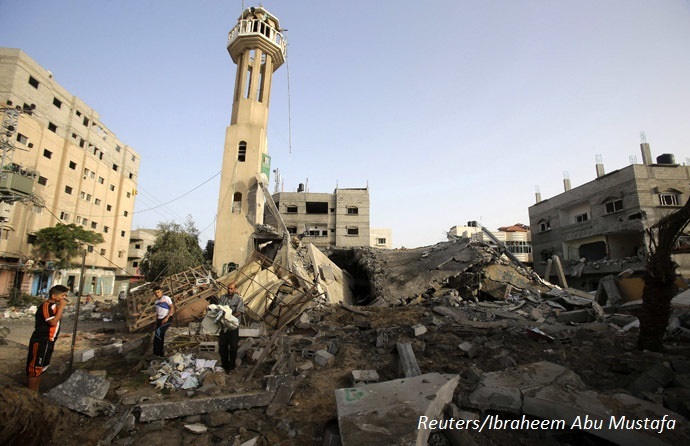 Meanwhile, The United Nations Security Council has called for a ceasefire between Israel and Palestine on Saturday. While alarmists warn that abrupt changes equate to instability and uncertainty, some developments just keep defying the status quo. Palestine last week has successfully been granted a “non-member” observer State status at the United Nations General Assembly. The 193-member assembly adopted a vote that saw 138 in favor and 9 against the resolution. Palestine Authority President Mahmoud Abbas said this is a significant step in achieving Palestine’s independence as well as brings it closer to rectifying “unprecedented historical injustice” inflicted on the Palestinian people since 1948. U.S. ambassador to the United Nations Susan Rice also openly denounced the resolution, echoing her Israeli allies saying that her government does not support a measure that undermines direct talks and that the November 22 decision did “not establish Palestine as a state.” She also added that the decision will not advance peace in the Middle East. With Washington’s backing, Israel lobbied voting nations to oppose the measure, but failed miserably. Israel’s position was so unpopular that even its traditional allies/sympathizers either abstained or voted for the Palestinians. Finally in its modern period, Palestine now has the capacity for self determination, especially before an international criminal court. It can now claim rights to independent development, free of Israel. This means that Palestine now can independently control its borders, or assert its own security and pursue its own trade with the world. But as these developments seal a better self-determination for Palestine, Israel is met with a new set of problems of its own. For one, with the upgrade to non-member observer state status, Palestine can now be a party to the Statute of the International Court of Justice, similar to Switzerland’s accession in 1946 when the General Assembly accepted it as a Permanent Observer to the United Nations. As such, Palestine now can file complaints against Israel in the world court. Palestine now also has the choice to ratify the Rome Statute of the International Criminal Court and file a complaint against Israel on war crimes, crimes against humanity, and possibly even genocide. Can the US (and Israel) block complaints by Palestine? Unfortunately for them, they cannot, since they are not signatories of the Rome treaty. Much like how they arrogantly behaved at the recent Assembly, the US announced back in 2002 that “the United States does not intend to become a party to the treaty,” and that, “[a]ccordingly, the United States has no legal obligations arising from its signature.” On the other hand, Israel’s indifference and naive behavior betrays not only international trust but also its very existence — it does not recognize the resolution that permitted the Palestinian upgrade to non-member observer state status and yet it forgets the fact that its very own existence was a result of 1948 UN resolution which permitted its right to self determination and independent existence.